It has long been rumoured that Osgoode Hall is haunted. Indeed, over the decades, several experiences of a spectral nature have been reported. In honour of Hallowe’en, we would like to share the tale of a mysterious visitor to the Great Library, as told to Kenneth Jarvis, former Law Society Under-Treasurer, by George Johnston. 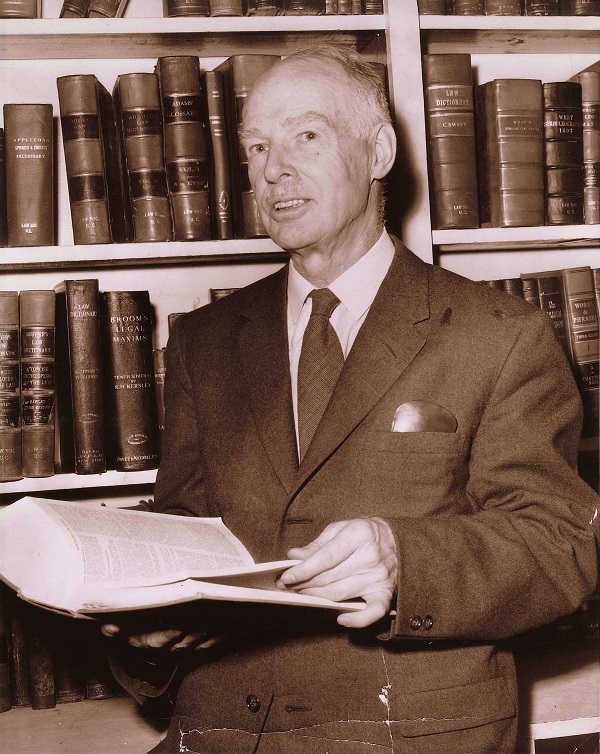 Mr. Johnston was called to the bar in 1919 and served as Chief Librarian of the Law Society from 1939 to 1965. Described by Jarvis as “a sober man of vigorous mental and physical health who lived to be over a hundred,” Mr. Johnston was not given to flights of fancy. The encounter he described to Jarvis occurred during the 1960s, a time when the Great Library was open each Saturday, but closed on Sundays. Staff would quietly lock the doors to the Great Library on Saturday evening, doors which remained closed to visitors until the library re-opened early the following Monday morning. Occasionally, however, the Chief Librarian would avail himself of the opportunity to work in the library’s peaceful quiet on a Sunday afternoon. One particular Sunday in late autumn, Mr. Johnston came to the library, unlocked the door at the south-east corner, entered, and then locked the door again behind himself. When he turned to walk the length of the room to reach his office he was surprised to see a person sitting at the first desk, hunched over a book apparently engrossed in reading. The Chief Librarian wondered who the person was and how he had gained access to the library. Perhaps the watchman had let him in, or perhaps one of the other four doors to the library had been left unlocked by mistake? He made a mental note to find out, but decided not to disturb the figure. When the Chief Librarian was ready to leave just before 5 o’clock, he saw the figure was still seated at the desk. He approached, but when about twenty feet away, the figure stood and walked quickly towards the south-east door, passing right through it and out of sight. It was that same door the Chief Librarian had locked earlier! It seems that paranormal activity in the library is not restricted to the past. 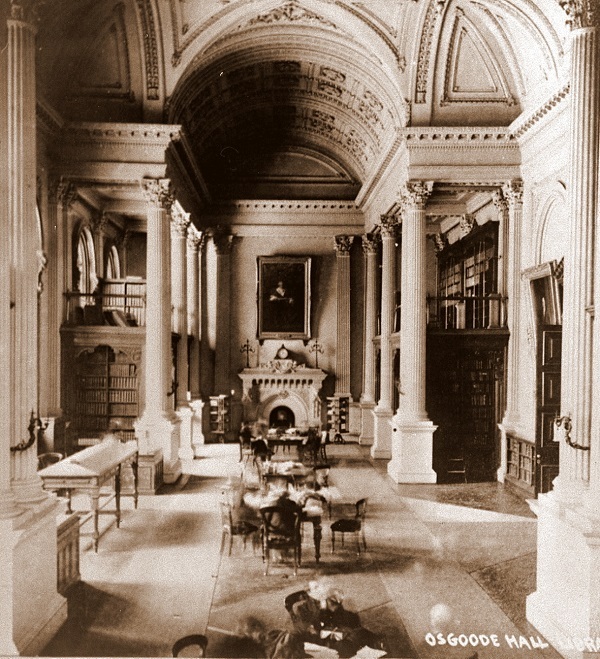 Only two years ago, during Doors Open Toronto, a visitor touring Osgoode Hall stopped in front of the massive stone carved fireplace in the Main Reading Room of the Great Library and declared that she sensed a “portal to another world” at that exact spot. It’s no wonder the building is featured on a number of walking tours of haunted sites in Toronto. Happy Hallowe’en from the staff of the Great Library! † Adapted in part from Kenneth Jarvis, Q.C., RCA, “Ghosts of Osgoode Hall” (Speech delivered at the Medico-Legal Society of Toronto Meeting, November 20, 1996), [unpublished].